William Morris wasn’t a quilter. But he could have been. We’re thrilled to have the opportunity to work with the Victoria & Albert Museum in London… mostly because it has meant getting to dig through their archives of vintage fabrics and textiles. (Or some of us anyway.) When it came to “what to do first”, William Morris was an easy choice. He was an artist who created extraordinary textiles for the home. An artist, textile designer, poet, social activist and one of the most important figures in the British Arts & Crafts movement. The beauty of his designs and his timeless color palette make his designs suitable for quilts, garments and accessories. The pattern-instructions to make the quilt are being presented in a journal-style booklet that includes detail on the fabrics used in each block, pages for notes and other tips. 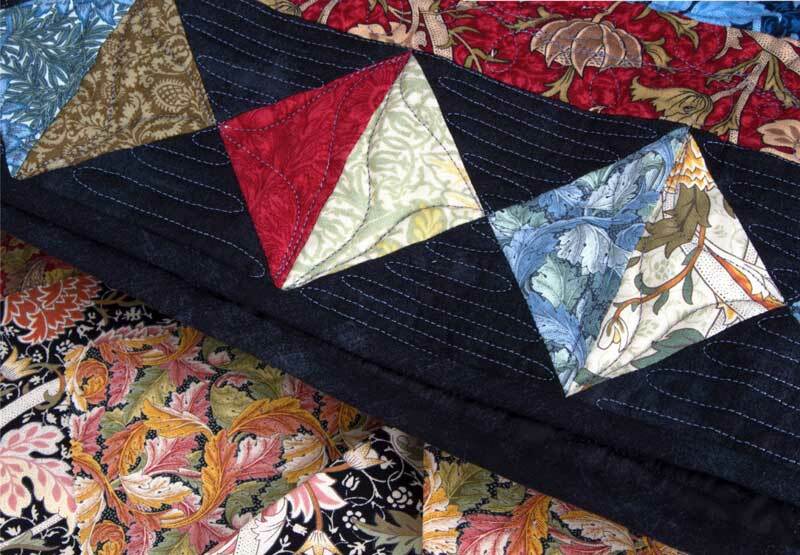 Made with less than a dozen different blocks, the William Morris Medallion quilt looks more complex than it is. That’s a good thing, right? While William Morris might have created his prints more than a century ago, the fabrics in the collection can be used to make garments and projects well-suited for today’s contemporary style. Note: While the pattern is written for fat quarters and yardage for block sashing, we used 7/8-yard cuts of the six Indigo prints from the collection, Moda Chambray in Royal for the cornerstones and binding, and the Silver on White Dots from Essentially Yours for the background. The finished quilt measures 71″ x 84. One of our favorite parts of the collection are the prints in lighter, softer colors. Maybe it’s just me but when I think of William Morris, what comes to mind is his darker, richer color palette. This is the William Morris palette that I think most of us know best – Ebony, that dark, lustrous shade of black. The most dramatic of William Morris’ prints is Cray. It has been reproduced for the V&A’s William Morris collection in eight colorways and while each is striking, I think it is the Ebony that is most emblematic of the William Morris style. It’s why we chose Ebony – in this case Grunge in Black Dress – for the background of this Hourglass Medallion quilt. So after months of waiting, the William Morris collection created in collaboration with the Victoria & Albert Museum is finally here, and it will be in shops in another week or so. I know I have a few pieces stashed. Such a beautiful collection! Congratulations on a super job! I have always loved William Morris fabrics! This collection is really beautiful! Thank you for a great blog post read! It looks like Josh wanted the shirt, but wasn’t super sure he wanted to model it? He has that look on his face my kids usually have…. I could just be looking at that with my Mom eyes. With your delicious reproductions I will no longer have to hoard the pieces of Rose & Hubble WM prints that I’ve had for fifteen year (maybe longer). This was a good write up of the collection and took us through various parts in a neat easy to understand and follow order. I hope to add this collection to my stash. Beautiful quilts and fabric collection! Love the blue Jumping Jacks quilt! Where and when will the first quilt booklet be available. Love this post! A great job as usual!! I’m interested in the medallion style quilt pattern as well! When will the pattern be available? Also the fabric collection? Hi Rosemary – The William Morris 2017 collection is scheduled to begin shipping to shops by October 16th, and the pattern book-journal will ship at the same time. Beautiful selection. I always loved the Morris collections Barbara Brackman did for Moda. Miss her at Moda fabrics. Thanks for another wonderful post. I can’t wait to see the fabrics in person! How can I find a retailer of these fabrics in my area?